Recently I've been loving the newly-released Clinique Jonathan Adler Brush Set (P3,500). This contains four synthetic brushes housed in a beautiful pink case. The brushes are travel-sized but quite hefty due to their thick lucite handles that feel as premium as the fine bristles of each brush. 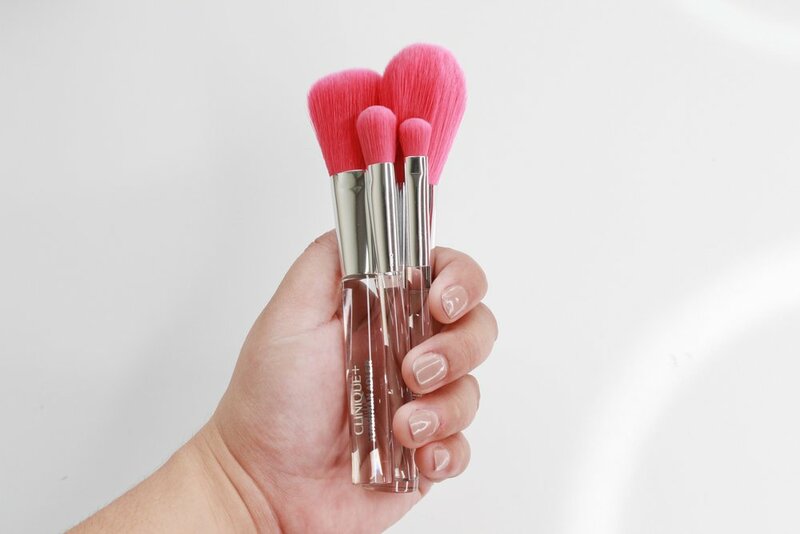 Both the brushes and the case feel luxurious, no doubt about it. I love the big powder brush for setting makeup and even building up the coverage of my power foundation. It deposits the product evenly even though it's not as dense as my usual brush! It's just right. The blush brush works well too - it's so, so soft, just like rubbing a fluffy baby rabbit on your face. The good thing is, zero rabbits were harmed in the making of these synthetic-haired brushes. I also like the big eye brush (I think it's for eyes) included. It's too big even for me to use for my eyeshadows, but it's nice for adding powder or cream products on smaller areas of the face. The eyeshadow brush is just ok. It works well with cream formulations, but isn't particularly impressive with powder. The pink hue runs a little bit after the first wash but it's ok afterwards. I did not notice any shedding. So, is this brush set worth the P3,500 splurge? There are other cheaper sets in the market with a more comprehensive selection. You can buy a pro set with 20 pieces for that price! If you're looking for that then this is not for you. This set is designed with travelers who like going to nice places and who don't need that many tools to do a full face. These are the absolute basic brushes for either a quick casual look or on-the-go touchup, not for clients or Instagram-style makeup. I feel like the Clinique x Jonathan Adler Brush Set is worth it if you don't like using that many brushes, don't like using animal hair tools, and want the most luxurious brushes to use for years to come. The quality of the brushes is great - the beautiful pouch, too! - so I feel the price tag is realistic. It's up to you on whether this suits your routine. Me, I love traveling with this! I recently brought the case plus two brushes to Phuket a couple of weeks back and it fit perfectly in my stuffed luggage. I added a few more full-sized eye and face brushes inside the Clinique pouch and they miraculously fit, as well. I'll bring these brushes again on my Tokyo trip next month! By the way, I'm part of the Clinique PH mailing list (mainly because they send very few emails and they're always useful to me) and I saw that they have a Bonus Time promo ongoing. If you buy items worth P4,500, you get a five-piece travel set! 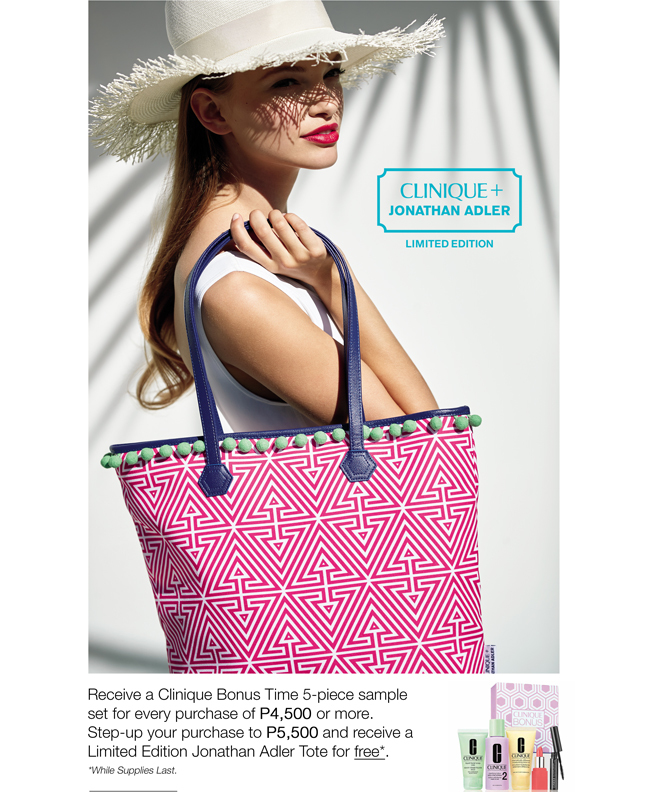 If you increase it to P5,500, you get the Clinique x Jonathan Adler Tote (which I have from the press event and I love it!). Just an FYI!